The surface energy effects of corona/plasma/flame treatments are irrelevant to adhesion. So what are we really trying to do with them and how, if at all, do they differ? JKR measurements show that typical surface energy measurements of corona treated PE don't even give the right numbers! 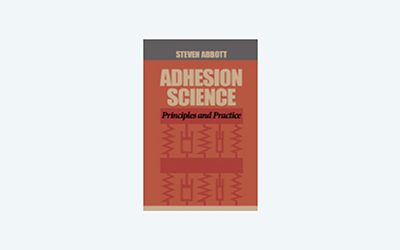 Another logical mis-step is to ascribe the increase in adhesion to extra surface area (the effect is trivial) or extra functionality (the adhesion increases are large even for inks/coatings that cannot chemically react with the extra functionality). The real explanation is simple. The treatment "opens up" the crystalline surface of the PE making it more amenable to intermingling/entanglement and also making it more "dissipative". As described in the Adhesibility page this explanation is simple, testable, powerful. 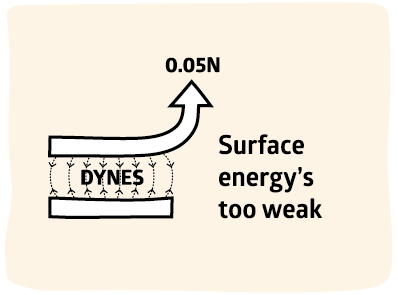 If the world of adhesion had put a fraction of the effort wasted on surface energy into performing adhesibility tests using, say, nanoindenters, we'd all be much better off and I wouldn't have to spend so much time explaining why the surface energy explanation is so unhelpful. Much less well known than corona etc. is the use of excimer lasers or xenon flash exposures (e.g. by 3M and Hoechst) to heat the top few nm of the surface in a super-short time which then cools rapidly to an amorphous state. This gives essentially the same adhesion boost as corona etc. with provably no change in surface functionality - because there are no radical reactions to add hydroxyls, carbonyls etc. Of course this doesn't work for cases where chemical functionality is required (e.g. for adhesion to PEI primers), but it makes the point that a lot or most of the adhesion boosting is from rendering the surfaces amorphous.